This guy shot his gun in the air and demanded all my money. This was very inconvenient because I was in the middle of an expensive meal at a fancy restaurant which was filled with people enjoying their dinner. My first thought was that I didn’t have any tape. Looking around I observed the other patrons took out rolls of tape and attached their bills to their heads, stood and headed for the door. They seemed relaxed about the entire situation as though they had been through this sort of thing before. I didn’t eat in fancy restaurants often so I didn’t know if this happened all the time or not. My second thought was that I didn’t have enough money to pay for both my meal and my ransom. If I was going to be killed, I might as well go to my Maker with a full stomach, I decided, and continued to eat my food. Also, I wondered that if I hunched over and was quiet perhaps the armed bandit would not notice me. That didn’t work out because when everyone else left, it was obvious I was indeed still there. However, one other man, sitting at an adjacent table, had stayed to finish his plate, too. I leaned over to whisper to him. It was at that point I realized he was quite a few years younger than me and in the prime of life. On the other hand, I was 70 years old and my prospects of earning more money were considerably diminished. If the guy with the gun showed up at very many more establishments where I was eating, I wouldn’t have any money left at all. Looking around I hoped to find another exit so I could slip out the back way without the gunman spotting me. As was my luck, the restaurant ignored the fire codes and only had the one door. So now I was down to it. My choices were laid out—stiff the restaurant and pay the gunman or pay the bill and let him blow my brains out. I didn’t know what I did because I woke up and remembered I had a doctor’s appointment. I taped my money to my head and drove to the office. 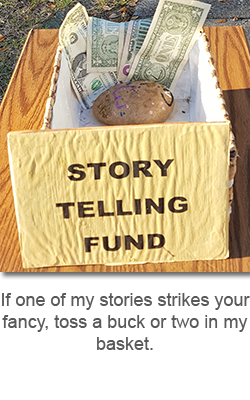 This entry was posted in Stories and tagged short story, storytelling on July 31, 2018 by jerrycowling.